Artist at Heart offers a whole host of fun activities for the entire family! 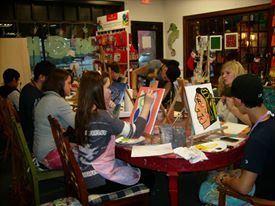 Paint on canvas, mosaic classes, art camps and classes and much more. Great for kids birthday parties, ladies night out, bridal showers, corporate outings and adult birthday parties. Programs for Boy/Girl Scouts, Home School art classes, and programs kids and adults with special needs in Lake County are also available!